This isn't strictly geeky. Or really, geeky at all. Sorry, I've already lost track of my mission statement. Um, you have to use a computer to make these cards. Computers are geeky. And coffee. Yeah! I live in Los Angeles. We don't have any snow or quaint wintry scenes here. We have palm trees, with strings of Christmas lights run around them. I wanted a card with that. Brew some dark coffee. This is kind of gross, but I just saved my grounds from the morning and ran the water through them again. Would taste really bad, but I'm not going to drink it. Put the linen paper in a full size baking pan. 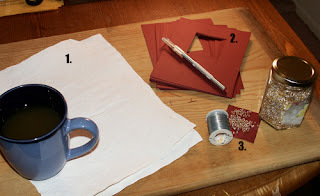 Tip: make an extra sheet or two, because these are very delicate and can get destroyed. Pour coffee over it until it is soaked. After a minute, pull paper out, drain over a sink, and scrunch paper into a ball as if you are going to shoot waste basket hoops with it. But don't. Wring excess water out of paper and flatten. The pattern of the coffee on the paper should be cool and chaotic. 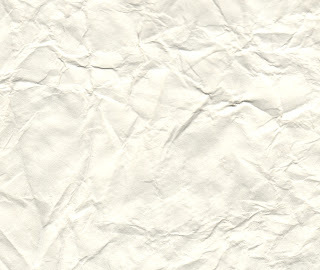 Put a paper towel on a flat surface, then place a paper towel in between each piece of paper and stack them on top of this, top with a heavy book, and let dry. It should print 2.5" square (crop the water mark). 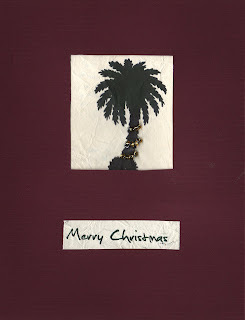 Cut up the palm trees and the sentiments. 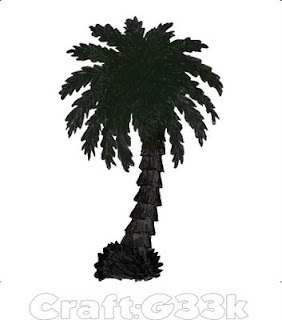 The edges of the palm tree don't have to be neat because it's going to be covered by a frame. Cut the corduroy paper to match the front of the cards, usually 5x7 inches. Draw a square on one card in the center (left-right) and towards the top, that is 2" by 2.25". Cut the square out with an exacto knife and use it to make all the other frames. Flip it upside down so you don't accidentally write on the good side. String sets of 4 beads, 4 beads, and 3 beads each per card on the beading wire, tying off the ends so they don't slide around. 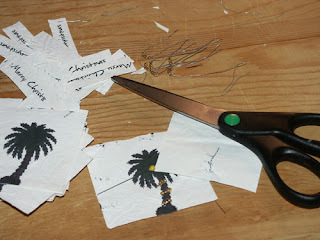 With a pin, poke holes through the palm tree picture and thread the wire through. Tie it down in the back, keeping it as flat as possible. Note: I am worried about these beads in the mail. You may want to make this easier and just use puffy fabric paint or something like that. 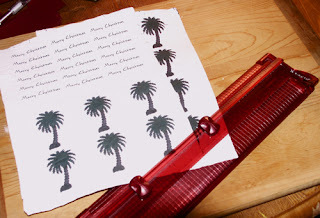 Using a glue stick, glue the palm tree pic to the underside of the frame, so that it shows through nicely. 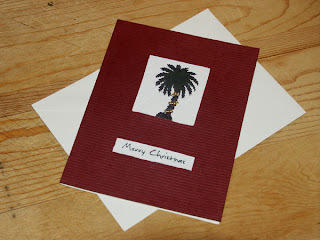 Glue the frame and the palm tree to the blank card. 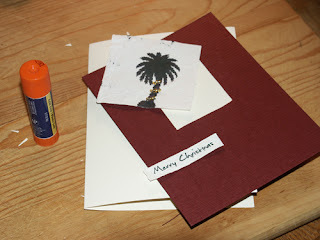 Then glue to sentiment to the front of the card. Now write something personal inside (or generic, whatever) send it to all you friends, and your mom, so she can put it on her fridge.